Archaelogical founds have shown long zithers in China with various numbers of strings.3 There is a story associating a 20 (or more) string qin with Fu Xi,4 but the most common tradition says that the modern qin descended from a five-string qin played over 4,000 years ago by Emperor Shun. A number of surviving melodies tell of Shun playing his his 5-string qin, singing of southern winds, and the world being regulated. 262.783 五絃琴﹕「（禮，樂記）昔舜五絃之琴以歌南風。（疏）無文武二絃。」 "wuxian qin" quotes the Account of Music in the Book of Rites as saying: formerly Shun played the five-string qin in order to sing Southern Winds (see Nanfeng Ge), with an undated (?) commentary adding that it did not have the two strings added by Wen Wang and Wu Wang. I have not yet found this commentary: the basic text (Yue Ji 17; see aso Qinshu Daquan, Folio 16, #4) mentions only the Shun story. The Shi Ji telling of the Shun story in its Book of Music (Yue Shu #19) also does not mention the later addition of the two strings. 262.783 also has a further quote from 宋史，樂志，五絃琴圖說 "Description of the five string qin" in the Music Annals of the History of the Song Dynasty. 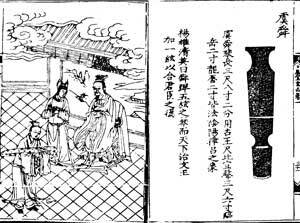 The image above is from facing pages of a section called Famous Historical Qins in Fengxuan Xuanpin (1539; QQJC II/23/4); compare it with the image in Taiyin Daquanji, Chapter 2. It is not clear to me what the image on the left is supposed to depict. Some music archaeologists, pointing to ancient instruments with more than seven strings, have argued that the qin originally had more than seven strings, but the number gradually decreased. However, these instruments were found only in the south, and this argument ignores Chinese tradition. It is just as likely that in pre-historic China there were a variety of long zithers. The true ancestor of the modern qin is a northern instrument, early models of which have not survived. The decrease in strings in southern instruments was perhaps due to the high regard for this northern instrument. See also Origins of the Qin and the following footnote. The exception to stories of early qin having five strings comes in commentary accompanying the illustration of a qin associated with 伏羲 Fu Xi (bio in Qinshi Bu, see especially this footnote, where it is called a 離 li). 5 melodies for nine-string qin. All have lyrics and most seem to be new (at least in the published qin repertoire). Note that the melody Long Ma Yin (1559) is played with five strings except for one note in the closing harmonics, which can easily be played on the 3rd string 9th position instead of as indicated on the 6th string 7th position. There may be other examples like this. The custom when playing a melody written for five-string qin is to use only the lower five of the seven strings. Presumably this is because these pieces are have the pretense of dating back more than 3000 years to before Zhou Wen Wang and Zhou Wu Wang supposedly added the sixth and seventh strings, whichin turn are named after them. Thus one might guess that a melody such as Ju You Cao, which uses strings 3 to 7, is set this way for reasons other than to indicate their antiquity. The above list includes only the first occurrence of each melody, the exception being that if a melody occurs later with a different name there may be an entry above. Further information tracing further examples of each melody is found by following the links above; tracing information is usually in a footnote. In addition, a footnote under the earliest Nan Feng Ge traces various melodies with a similar theme. At time of writing my active repertoire includes only four of these, Nan Xun Ge, Nan Feng Ge, Si Qin Cao and Shenren Chang.